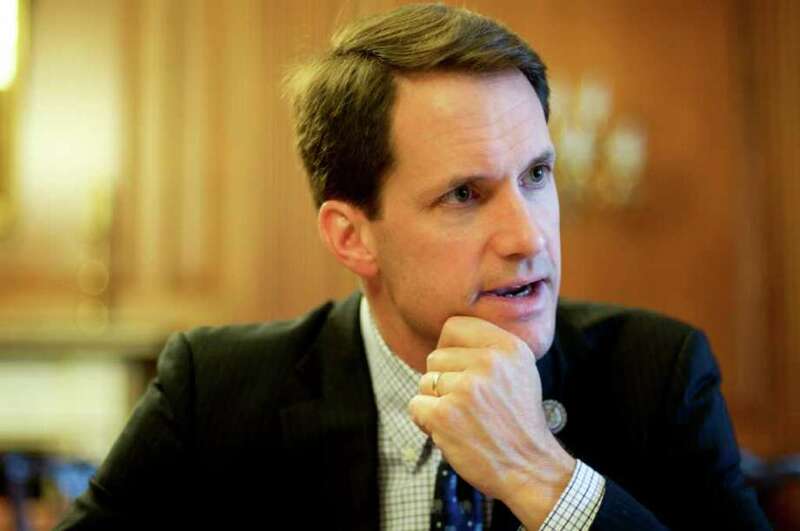 WASHINGTON -- U.S. Rep. Jim Himes, D-4, the former Goldman Sachs vice president now representing southwestern Connecticut in Congress, says lawmakers and the Obama administration should consider both spending cuts and tax hikes to battle the growing budget deficit. "The adults in this building have to agree that everything is on table,'' Himes said in an interview in the U.S. Capitol. He was referring to Congress and the closed-door budget negotiations being conducted by Vice President Joe Biden and six members of the House and Senate from both parties. The group hopes to unveil its recommendations by the July Fourth congressional recess, some two weeks after President Obama and House Speaker John Boehner, R-Ohio, had a friendly Saturday golf game to talk about their policy differences. Himes, a Democrat and one of the few members of Congress with financial industry experience, looks at the talks through both policy and political lenses. "We can't go into these negotiations and say, `I won't consider A, B or C,' " Himes said, re-emphasizing his point that all options should be considered. In the politics of the budget, Democrats and liberals use the phrase "everything is on the table'' to mean tax increases. Republicans and conservatives use the same phrase to mean cuts in entitlement programs such as Social Security and Medicare. All parties are looking for the political cover that they hope the Biden group's bipartisan, bicameral recommendations will provide in coming weeks. No one wants to run for re-election next year on a platform bragging that they voted for higher taxes or for cuts in Social Security. But some blend of both is likely to emerge from the Biden group. For Himes, for now, that kind of political cover comes in the form of last year's Simpson-Bowles deficit commission report on ways to overcome over-budget spending. That report -- titled "The Moment of Truth'' and written by a team led by former Sen. Alan Simpson, R-Wyo., and Erskine Bowles, former chief of staff to President Bill Clinton -- recommended a package of tax increases -- such as a 15-cent-a-gallon hike in federal gasoline taxes -- elimination of tax preferences for capital gains and dividends, and limiting the deduction for mortgage interest. The Simpson-Bowles report also recommended massive spending cuts, pushing back the age eligibility for Social Security and freezing physician reimbursements under Medicare. The goal: Getting ahead of the deepening federal budget deficit that is likely to exceed $1 trillion this year for the third consecutive year. Himes embraces the Simpson-Bowles report with the same caution that Obama has, even though it was the president who created the commission in the first place. He said some increased federal funding may be needed to pay for infrastructure upgrades but he wasn't certain how much of a gasoline tax increase would be needed to generate the money. In the background of the budget deficit negotiations is the Aug. 2 deadline for Congress to approve a higher ceiling on U.S. government debt. Treasury Secretary Timothy Geithner has warned that if no action is taken to raise the debt ceiling by then, the U.S. could default on its obligations, a possibility that leaders of both parties agree would be a financial disaster. Last month, Himes was one of 97 Democratic House members who voted to raise the debt ceiling by $2.4 trillion, without any linked spending cuts. The government has already reached the limit of its borrowing authority, $14.3 trillion. The measure was defeated when 318 House members -- Republicans and Democrats -- voted against it on the basis it should be accompanied by plans for spending cuts. Meanwhile, all eyes are on the Biden group, which the vice president said last week would ramp up its meeting schedule in an effort to meet their self-imposed July 4 deadline, the day before Himes' 45th birthday. Members of the group include: Sen. John Kyl, R-Ariz., the Senate Republican whip; Rep. Eric Cantor, R-Va., House Republican leader; Rep. Chris Van Hollen, D-Md. ; Sens. Daniel Inouye, D-Hawaii and Max Baucus, D-Mont., and Rep. Jim Clyburn, D-S.C.